You can be bold and innovative at least in your bathroom for a change. The wall decorating papers can help you to expand your talents in the home decoration front. Not just for the end of the seat excitement but also for few relaxed moments giving you the utmost privacy. For the only bathroom singer people, this is a recommended thing. And you won’t be spending a fortune if you do this DIY project. The advantage is that you can change the design as often as you would like to, as the cost is not very high. Splash a subtle bloom of nature with these unique wall tiles. 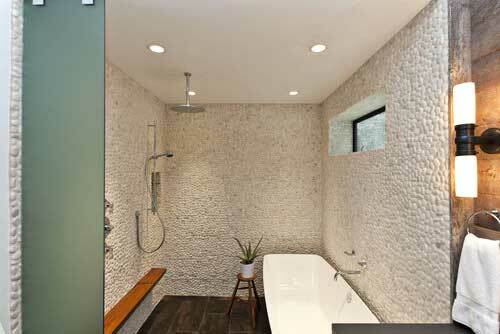 You can perfect the bathroom wall that will go well with the color of the tiles and fittings. You can choose from a wide range of colorful wall decorations and bring the spring back to the bathroom. The frosted glass door in the bathroom is a welcome change to boring interiors. Bring in a cool snowy outfit right into the bathroom effortlessly potted plants, decorative vases and mood lifting faucets will merge perfectly with the swinging and slide frosted door. You can have an innovative and antique mirror to go along with the frosty theme and these frosted glass door can also be complimented with the exotic carpet mats. Rather than having the conventional and highly polished wall tiles, you can choose from something revolutionary like pebble designs. If space saving is the main aim you have in mind for your bathroom, then consider putting some concealed storage cabinets as well. A signature design would bring in applause from unexpected quarters. The color of the bathtub should be chosen with care so that it goes very well with the overall picture. A cut lemon design on the wall? 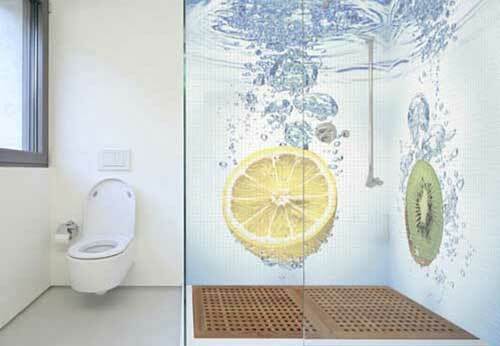 Of course, a lemon inspired wall tiling would enhance the appearance of the bathroom considerably. You can have other fruits like peaches, grapes or flowers to suit your imaginations. An illusion of extensive space should be created with ease. The round shape always represents coins or money so that you can expect prosperous time ahead. 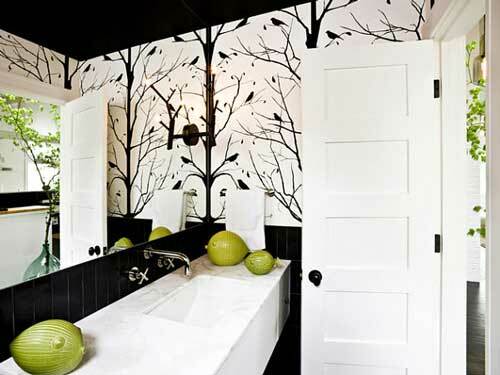 Note: You can Sprinkle the wall with a display of exotic colors to make the bathroom more vibrant. The days with traditional lightings are long gone and by using those in your bathroom can be awfully creative. 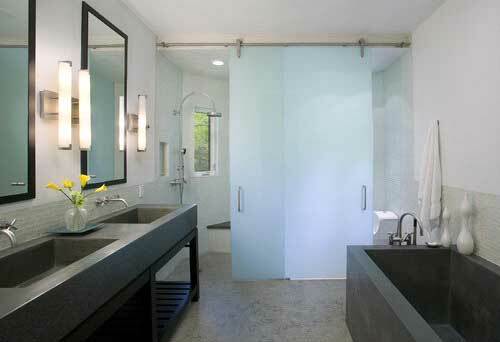 Nowadays you have a plenty of lighting ideas to meet your desired result for the bathroom. The rather new emerging LED lights would be great to go along with the walls you have carefully designed with your imaginations. Unobtrusive or Glaring these lights can spell the right shade to the frosted doors or curtains, the bathroom will look luxurious and inviting. A proper lighting would kindle your reading habits as well. With these ideas you can bring in harmony in the bathroom sink, table, shelves, etc in your bathroom. Aman Verma is a passionate blogger who has been blogging since 2009. Apart from blogging, he spent most of time in writing content for websites. By now he has finished numerous ghost writing and creative content writing projects. He enjoys writing most on Home Improvement topics.